Business is not changing... it has already CHANGED! We are no longer bound by cubicles, desktop computers and conventional business knowledge. 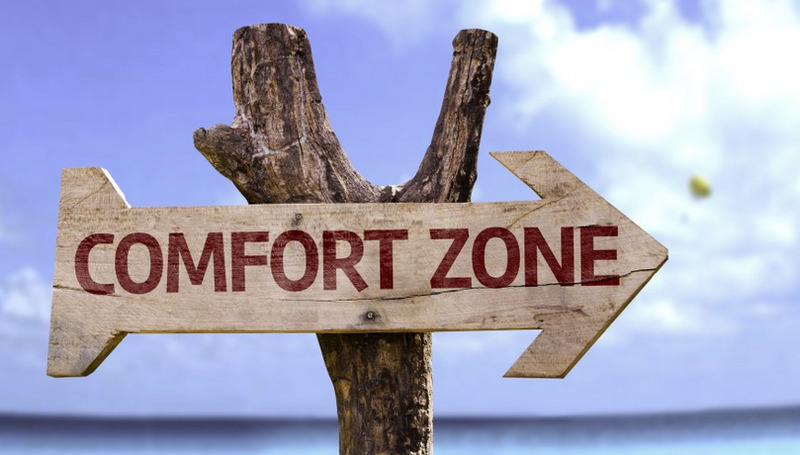 Connectivity is the new Golden rule... if you have it you can be the ruler! We wanted to look at three areas where connectivity in business is critically more important than knowledge in business now. We'll look at cloud based documents (Google Docs, Dropbox, Box, etc. ), wireless connections (wi-fi or mobile data) and online platforms (Linkedin, Gmail, Facebook, etc.). When you have possess connectivity to these top three core business assets to make really make things productive, efficient and scale! To frame this discussion, Brick House Media Co helps small business leaders and companies leverage these online "connected" assets to help grow their own companies. Some call it growth-hacking techniques, but honestly... it's becoming standard operating procedures now. We help our clients create two core Google documents; an account media master doc and an online strategy planning doc with calendar links. By making these core docs available via Google Docs, we are able to access them from any computer or mobile device/tablet, as needed. Offering the client and our services the ability to be nimble, dynamic, timely and hyper efficient in the times of need. Clients love this, gain efficiencies and get hyper organized! 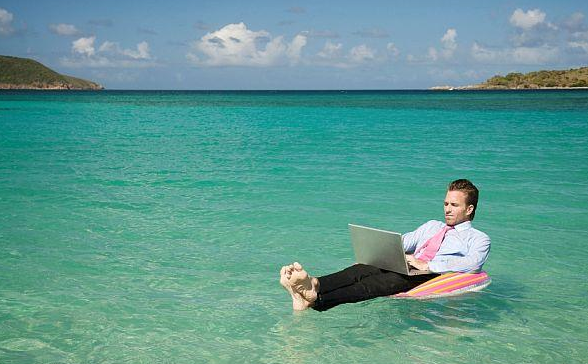 Careful not to get salt water in the keyboard... rookie beach business guy move! We have all experienced the feeling of being "out of range" or disconnected, whether it is due to loss of signal or even worse, a dead battery! Think about all the access you loose, GPS, email, text, phone and those lovely cloud docs. Loosing this ability can really kill productivity and efficiency. We've had days when the wi-fi dies and it literally feels like a fire alarm... so go outside and get some sunshine. We recommend daily walks and breaks anyhome, phone free! We almost run our business now via Linkedin, Facebook Messenger and all the suite of Google services like Gmail, Hangouts, Maps Youtube (owned by Google) and of course Search. If we can access these platforms, we can create, share, communicate plus reach out for new business leads. More and more our clients are sending us messages on Linkedin, Facebook and even SMS text messages (not just a fan for biz). Gone are the days of the everyday: phone call, in-person meeting (although still highly effective), traveling far distances to shake hands (again super valuable). By really getting savvy at leveraging these online platforms you can run a successful online business... yes, the future is today! 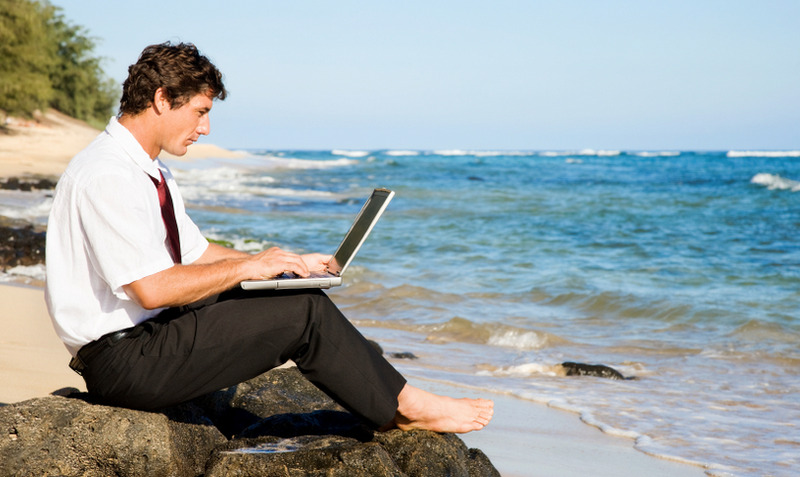 Thanks to Google Images for always providing stock images of business on the beach! Newer PostCreating a SquareSpace Blog Page for Subscriptions! Older PostWe've Moved to Port Workspaces in Oakland!